A thief steals a valuable necklace from a wealthy Gotham citizen. The owner of the necklace identifies the thief as Catwoman. Meanwhile, Selina Kyle is on the phone with her assistant Maven. They are trying to raise cash to bribe Russian officials to save the habitat of rare Siberian tigers. Batman and Robin arrive at Selina’s apartment ahead of the police. Selina says she was in the bath all night, not out stealing jewels. She tricks the dynamic duo and makes her getaway, intending to clear her name. In disguise, she attends a party thrown by Thomas Blake. His gold statue of Bast makes a tempting target for a copycat thief, and Selina intends to catch him. Bruce Wayne and Veronica Vreeland both see through her disguise, and Veronica makes a scene. Selina runs, and finds herself hidden by the host, Thomas Blake. He quickly explains he is her biggest fan, and shows her his basement full of Catwoman mementos. He was the thief who stole the necklace, and it was a part of a plan to lure Salina to his home so they could meet. Selina refuses his advances, but says if he can steal a priceless Ming tiger from the Peregrinator’s Club, he’ll be her hero. Thomas Blake is soon dressed as Catwonan, and breaks into the club. 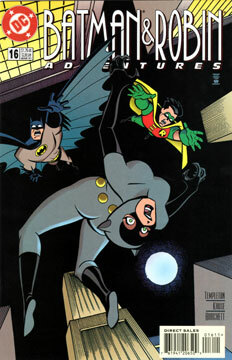 Batman and Robin are there to stop him, and they quickly do so. As the dynamic duo escorts Blake to the police, Catwoman shows up to prove her innocence. When she heads home, she reveals the statue of Bast she stole from Blake, which will finance her Russian endeavors. I’ve always felt that writing a Catwoman story during the BTAS years must have been difficult. How many times can Selina be framed and prove herself innocent before the audience gets bored? It’s a tough assignment, but I think Templeton did reasonably well here. Very good. There’s a great panel on page 5 of Batman jumping out a window. I just love it! Oh yeah, enough to “erase” this story from continuity. Thomas Blake is Catman in the mainstream comics. He shows up in the animated episode “Cult of the Cat” several years later, as a very different person. But there’s no way the comic book team could know this.